Having experienced a few days of a bitterly cold winter in Toronto a few months earlier, spending time in the summer months seemed a better alternative. So on return it was fortunate that we were able to actually spend an entire summer in Toronto. With the benefit of a few resident friends, assimilation into Toronto or ‘T-dot’ way of life was made all the more easier. It’s always daunting arriving into a new city in which you intend to stay a while. Which is why an airport pick up from our friends Jen and Ken was a very welcoming gesture. They do say the Canadians are some of the nicest people! We also had some friends, Cath and Marty, from Australia who had recently arrived so we were also lucky to have a place to stay until we got settled. The usual tasks of getting established in a new city include the following in roughly this order. A phone, a job, a place to stay and a circle of friends. So having the last two by the first day was a great head start. Coupled with the fact that Allison had actually secured a job before leaving Australia. A few phones and a job for me and we were all but settled! Finding temporary office work seemed a little troublesome with it not really being the done thing in Toronto. Meanwhile Marty offered to introduce me to the moving company he was working with to get some cash initially. With moving house normally being a nightmarish experience I was hesitant to do this full time! However after the first few jobs, while physically it was tough, the pay was decent and the fellow movers were certainly entertaining. Plus I realised when you move for yourself it’s the packing and unpacking that is the worst. The actual moving is not all that bad. 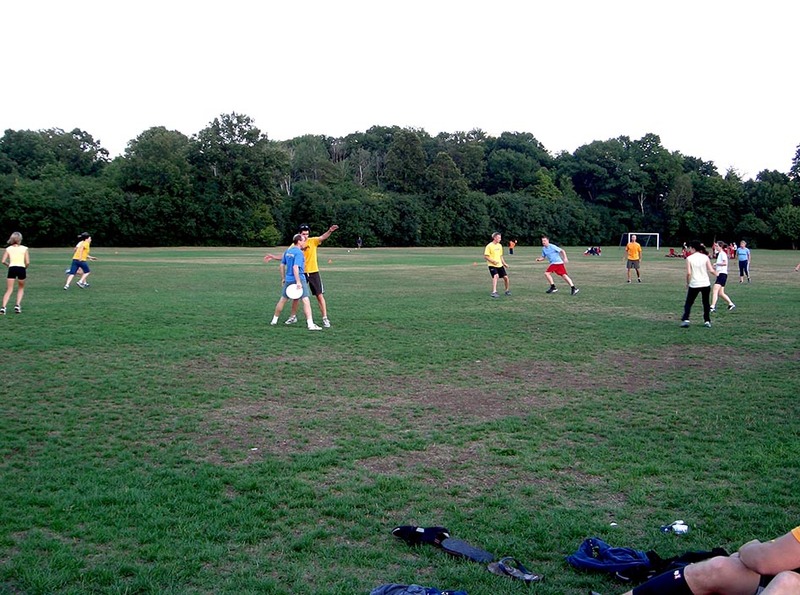 We were invited to participate in a popular Toronto recreational sport of mixed Ultimate Frisbee. A decent game to keep fit and practice the art of throwing a frisbee in as many ways possible. A good opportunity to expand the circle of friends going out for drinks and dinner after most matches. Chasing a frisbee after moving furniture all day was a challenging task! We were once again very fortunate to be invited to Jen’s cottage about 2 hours north of Toronto. 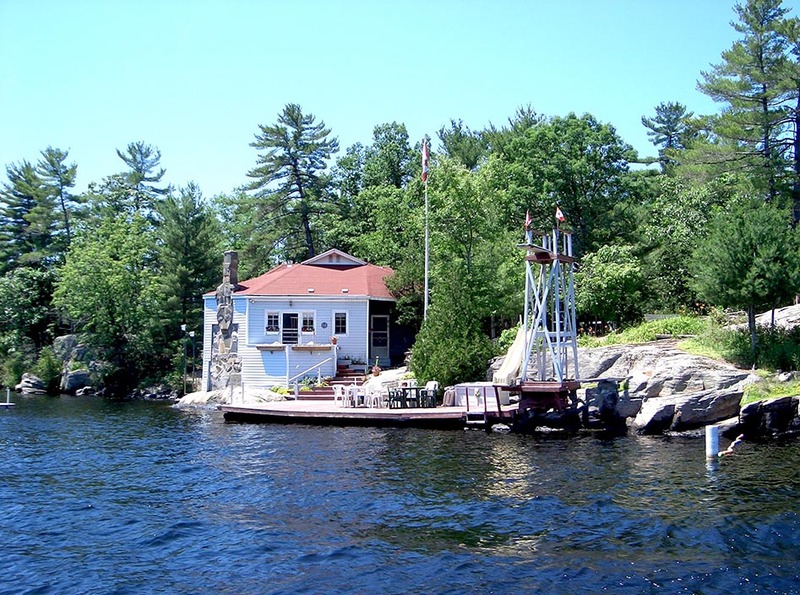 ‘Cottage Country’ as it’s known is an extremely picturesque part of the world. Picture postcard Canada with cottages nestled amongst the many lakes, rivers and pine trees. Jen’s family actually securing an entire island! On which they had 4 cottages for various members of the extended family. An annual event each year involved the entire family participating in a combination of sports for all ages named ‘Fryathlon’ given the family name was Fry. Ice Hockey is the major sport in Canada with the Maple Leafs the local Toronto team. During our stay there was a players strike on so no games were played. 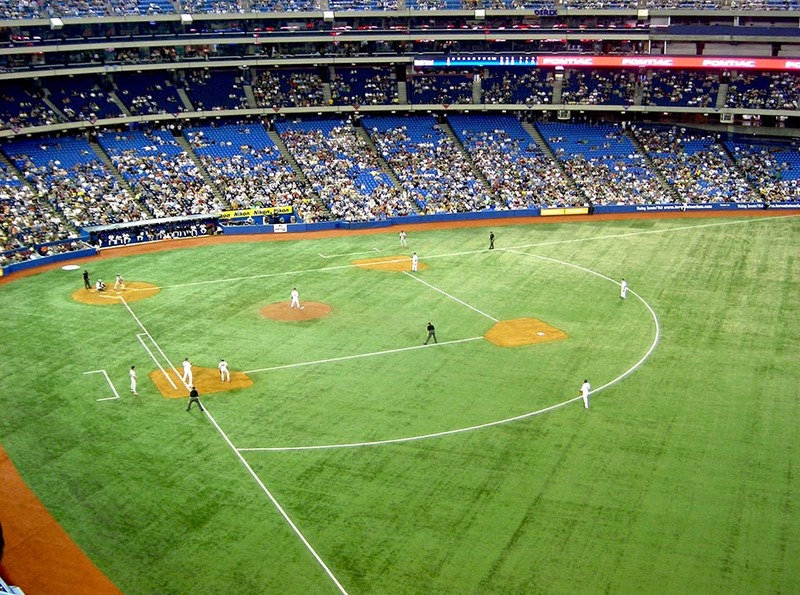 However we were able to see the Toronto Blue Jays play The Boston Red Sox in Major League Baseball and the Raptors play in the NBA. We also saw the Toronto Argonauts play in the Canadian Football League. Concerts too. A surprise trip to see The Killers after Marty scored a few tickets from a generous moving client. We also saw U2 as part of the Vertigo tour. Also Jet, an Australian band playing in a low key gig while on the road with Oasis. Food festivals like the taste of Danforth and others brought out the cultural diversity of Toronto which was indeed a very cosmopolitan city. Side trips to Kingston and Thousand Islands, Niagara Falls and north to Tobermorey on the Bruce Peninsula were diverse and also very Canadian. Toronto Island in the massive Lake Ontario gave a look back on the city skyline including the CN Tower which dwarfed the rest of the buildings in the city and can be seen from virtually every part of the city. We also ventured further north to Huntsville where we experienced another region of cottage country courtesy of Ken. Before finally departing after summer we got to experience the fall colours while staying up in Markham. The trees were stunning with their changing leaves and continued the picture postcard experiences we were privileged with every time we left the city. Seasons turn quickly in Canada and as we departed on the train east to Vancouver the first of the snow began to fall.